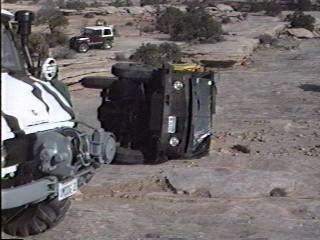 This tipover happened on the Moab Rim Trail at Moab, Utah. I was coming back down the trail at the Z-turn, and dropped a front wheel into a hole. 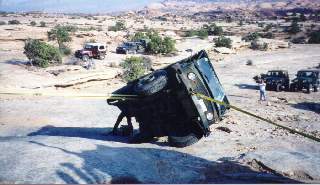 The truck tipped over very slowly, and the top front corner of the cab came to rest on a large rock. That was fortunate, because the rock stopped the trucking from rolling over any further. 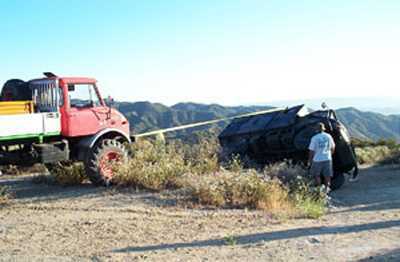 Dan Johnson lent a hand (and a winch cable), and we winched the Mog back onto it's wheels. Click here to see some video of the tipover. Clikc here to read the trip report. We were on Golden Spike, coming up on the Steps. 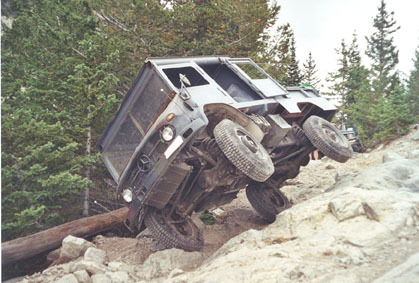 This obstacle is a little tougher for a Unimog, because the steps are spaced almost exactly the same as the wheelbase of a Unimog. Unfortunately, Bob Ragain got a little too much tilt trying to climb the steps, and the HamMog tipped over. The truck's windshield was mashed, but no one was injured. We rigged up Kai's MooMog winch to the frame of Bob's truck to pull it back up, and Kelvin's winch to the front of Bob's truck to keep it from rolling off down the hill once it was back on it's wheels again. and we got Bob's truck back on it's wheels. The engine wouldn't start at first, but once the oil drained out of the cylinders back down into the crankcase, it started and ran OK. I am sending the attached photographs in order to establish my credentials as a member of the exclusive Brotherhood of the Horizontal Mog. Our little mishap occurred on Labor Day, about halfway down Mount Blanca. Fortunately, no one was hurt. The Mog sustained some non-scheduled customization of the right rear door, but was otherwise no worse for wear. Some nice people in a Blazer winched us back upright. (I don't think I'll ever live that down) The engine started right up and we were on our way again. As a result of this little escapade, I am now in the market for a 24v winch and am working overtime to get some HEAVY boxes built to go under the bed and lower the center of gravity. For the most part, I was amazed at what this thing accomplished. This was by far the most difficult trail I've ever had it on and it performed beautifully. The only problem was the momentary lapse of reason on the way back down that lead to our flop over. Ah well, I learned my lesson. And my roll cage got a real world test that was much more thorough than any I could have devised. Well, let's start at the beginning. This was a Ham radio field day, an event where radio clubs from all over the U.S.A. try to reach each other using all types of radio communication in a 24 hour period. This is a perfect opportunity to take out the ol� radio box, just because. Ed Wright's radio club uses a plateau in a town not too far from my home. It's all fire roads but it's still fun. We had 4 mogs total; myself, Ed Wright, Ed Gaitley and Matt Oliphant. Matt had suggested we take my mog down the road to a great little section of hill that was all rutted with lots of articulation opportunities. 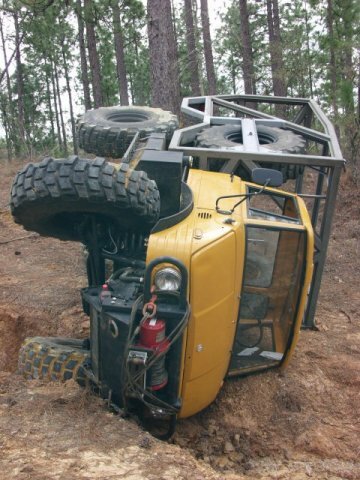 We did it last year in his 416 truck and got a little stuck mid way through with the rear wheels spinning. He said I should have no problem since the weight of the box will plant the rears really well. So we approached it. This was my first opportunity to take this truck up something like this, so up we went. It was so smooth and effortless I couldn't even believe it! 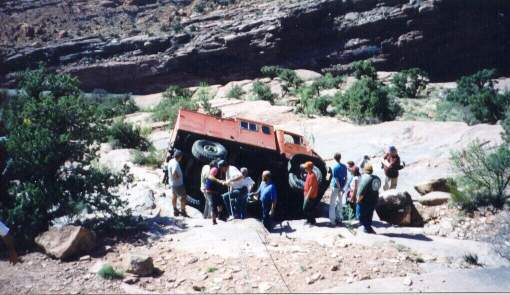 Even the last section where the truck is looking right up into the sky with one wheel off the ground was a cakewalk. So, we went down the road that was right next to it and did it again! The same great feeling. I thought about descending it but that last section where the wheel came off would be the first part now and the angle was just too wrong looking from this side, so we didn't do it. Back up to camp we went to get the other moggers to experience this too! I loaded Ed Wright in the passenger seat and Matt hopped in the back so he could get some photos of that wheel off action. I needed to turn the truck around to go back. It was a little tight and I needed to make a multi pointer 3 point turn in a u-shaped section of the road. 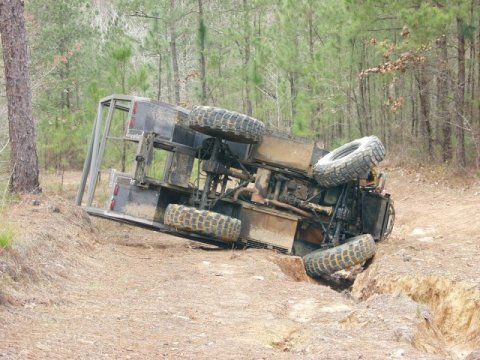 As I was backing up, the rear of the truck was going up an embankment, you know, the kind fire roads have cut by dozers. Well, as I was doing this, I couldn�t really tell where I was, so I opened the driver�s door to lean out and look, and all of the sudden I feel something�s just not right. THE TRUCK IS FALLING OVER!!!!! Yup. Door open, me leaning out and the truck is falling over. What happened is that the left side rear wheel slid off the embankment sideways getting trapped by the side of the hill and the road bottom. 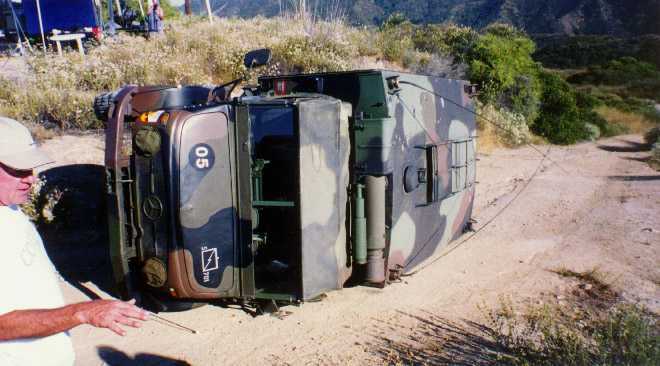 It then became a dynamic roll over. The momentum of the back took the front, and we slowly fell onto the driver�s side. I had only a second to pull myself back in and shut the door! BOOM! we are 90� WRONG NOW! Now what? I've never been in a situation like this before! I'm looking around trying to make sense of it the and I look up and see Ed hanging on for dear life. So I repositioned myself and pushed Ed up and out, and then I climbed out the passenger side. I immediately opened the side door of the box looking for Matt, and pulled him out. We were all safe! And the truck is on its side. 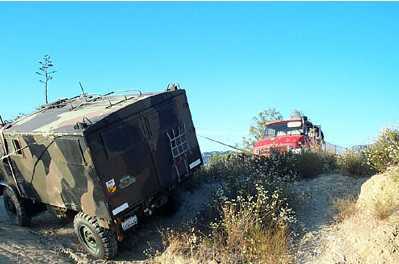 A big heavy truck... on it's side. No one could believe it. All of Ed's radio club was standing there with jaws dropped in amazement. One guy watched it all and said everything was fine, then that one wheel slid off and that was it, she was gone. So now what? THANK GOD FOR MATT! He knew exactly what to do. After inspecting ourselves and then the situation, Matt took off to his house, which was literally down the street a few miles to retrieve tow straps and big wood blocks to aid in holding the wheels in place so the truck wouldn't slide. That was the longest hour of my life, waiting for him to return. I watched fluids of all types weeping out of places it just shouldn't! When he got back, he set off to work. The problem was how to lift it AND where it would come to rest. 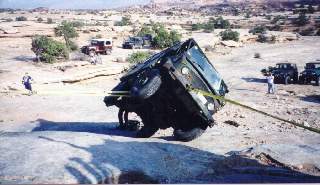 Since it slid off a 45-degree bank, that's how it would sit when lifted!! Matt took his 2 20 foot nylon straps and we were able to wrap the very front of the box all the way around so when he pulled on it with the 416 it would do the least damage. We hoped! All hooked up, wheels blocked so it wouldn�t slid on it's side, Matt tightened up the tension on the strap. He threw the 416 in low reverse and started to pull..... slowly.. nothing ... a little more...then the beast began to rise!!!!! HE DID IT! It's righted! But at 45 degrees! He locked the 416 down, holding my truck at the most disgusting angle next to laying on its side of course! Now, the only thing we can do is take one of the other 404's and pull it out of this death-defying situation. Ed Wright was chosen. After some hair ball positioning of his truck he got into position and we double wrapped some steel tow cable from his pintle to my front bumper tow mount. Now I had to climb back into this death trap and pray we could guide this out of the hell it was in! Ed throttled up and started to pull. Matt was in the 416 holding me and I was not looking forward to falling over again! We did it! All together we saved the rig! And got it back to almost level ground!!! Amazingly, I only lost my drivers mirror the rain gutter on the box and some very minor bent sheet metal to the box only! Once righted we checked the engine for hydrostatic lock in the pistons, It sounded good. Then with everyone watching, I started it up, and it stayed running! Smoking like a chimney from the tailpipe but running. One hour on its side and it runs! I then pulled it forward to truly level ground and surveyed all the carnage. I don't think we could have righted her without other the mogs. 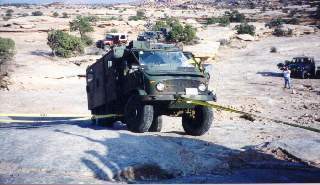 The 416 was the make it or break it help vehicle. Over all, for what happened it's not that bad. I can fix everything that got damaged and all that were inside got out unhurt, and that's all that really matters in the end. So that's my story. My baby got a boo boo, but she will heal. THANK YOU SO MUCH MATT AND ED! And everyone else who helped, which was almost everyone there! 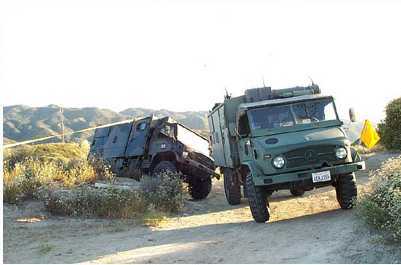 The 406 on it's side. Getting the 406 up on its wheels again. 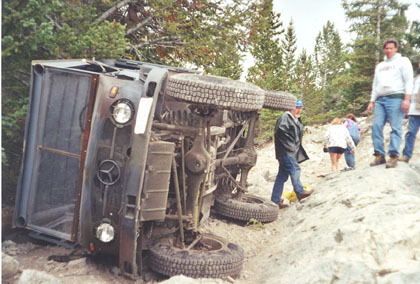 and again on April 21st, 2002 in Lefthand Canyon. Well Saturday it happened! I rolled a vehicle while me and a friend were in it. We were just having a blast driving a Haflinger through some ditches. 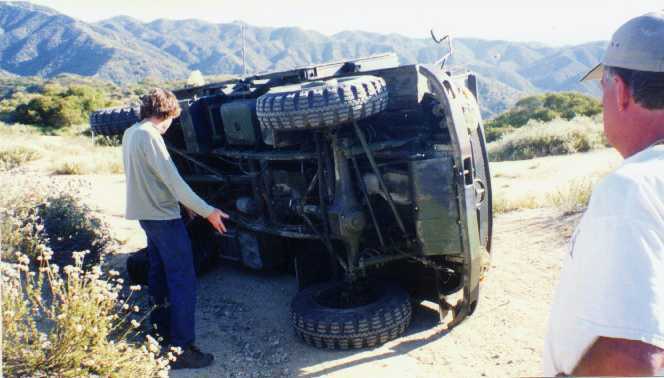 While going up one side the vehicle went to much on the side and it rolled. Luckily it had the single cab roof on it and the tubing took the weight. No damage to the car and we were not hurt except for a brused knee and a very brused ego. Well, it was an experience and I learned a lot from it. It was all my own fault but luckily nobody was hurt.